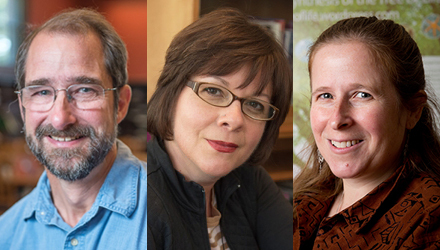 This year’s Sherrerd Prize winners—Mark Brandriss, senior lecturer in geosciences; Ginetta Candelario ’90; professor of sociology and Latin American and Latino/a studies; and Laura Katz, Elsie Damon Simonds Professor of Biological Sciences—will be celebrated at a ceremony on Nov. 14, at 4:30 p.m. in the Campus Center. On Nov. 6, Smith students from around the world prepared some of their favorite dishes to share with the campus community as part of International Students Day. The event is organized by the International Students Organization and Dining Services. 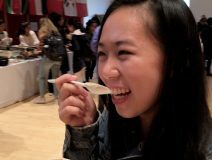 Join Agnes Hu ’19 as she samples the student-made cuisine. 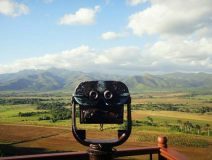 This year’s Smith in the World Conference, to be held Nov. 10 from 3:45 to 6:10 p.m. in the Campus Center, will showcase diverse student endeavors—from a software engineering internship with Google to a research project on the interaction between mainstream and immigrant culture in France. 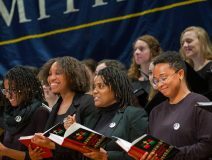 The theme of this year’s Otelia Cromwell Day, celebrated on Nov. 2, was “Resist, Act and Persevere.” Enjoy a photo gallery of this year’s main event, which included a keynote address by author and cultural critic Roxane Gay and performances by Blackappella and the Black Campus Ministries Praise Group, with the Smith College Choirs. Registration is now open for the 2018 “Smith College Women of Color Conference: Persistence, Possibilities & The Power of Our Voices,” being held on campus April 13–15, 2018. Close to 30 presenters will offer workshops and discussions on a range of topics, from self-care to unlocking your leadership style. Register now and connect with distinguished alumnae, faculty and students of color for an exciting weekend of personal and professional development. In a letter to the Smith campus, President Kathleen McCartney reaffirmed the college's commitment to maintain an environment that is free of sexual and gender-based harassment and violence. "Such conduct," McCartney wrote, "interferes with the security, well-being and professional climate of our community..... Sexual misconduct has no place at Smith College." Should you take a job or take the plunge and start your own business? Can you really make a living working at a wildlife refuge? How might taking the job you don't want lead to the one you do want? These topics and many more will be discussed in the latest series of professional development webinars sponsored by the Office of Alumnae Relations. Each lunchtime session is free and open to the entire Smith community. Registration is required.